The New York Times, a pioneer of using virtual reality in journalism in 2016, has teamed up with IBM to begin entering the world of augmented reality. "IBM has a long history of commitment to STEM, and to fostering diversity, tolerance and inclusion, which is core to our company's culture and values," Ann Rubin, vice president, branded content and global creative at IBM, said in a statement announcing the app. "We were inspired to use this app to share the stories of unsung STEM innovators who have changed the lives of people around the world." To access the content, users can use the app at tourist destinations in 10 U.S. cities, at science-focused places such as the NASA Langley Research Center and Kennedy Space Center, as well as at universities such as California Polytechnic State, Duke and Princeton. The app, created by the Times' T-Brand Studio branded content team, was the first project produced alongside Fake Love, a design agency acquired by The New York Times last year. 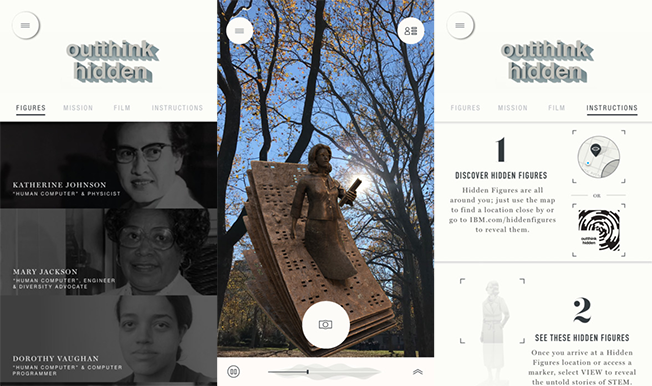 IBM's agency, Ogilvy & Mather, also worked on the app. "We've been waiting for the perfect opportunity to tap into Fake Love's wealth of talent and creativity when it comes to experiential storytelling," said Sebastian Tomich, senior vice president, advertising & innovation at The New York Times. "We knew we couldn't build The Times's first AR experience just because we had the means to do it; we needed the right partner and the right story to tell. When we spoke to IBM about their work with 'Hidden Figures, we recognized that this was an opportunity to bring users into the experience of the film and the remarkable women it showcases."